After a busy day at work, for both of us, we made it to Denver around 4:30 pm and checked into the Ritz Carlton. They upgraded us as I’m a Platnium Member. About 2 hours later we headed down to try to catch a cab to the show. As soon as I walked around the corner to the lobby, I recognized a family standing there. Turns out it was Dave and Sue, the parents of Jag’s grade school friend and classmate, Enzo. They were shocked to see us and rushed over and gave us big hugs. We really like them and it was great to see them. Turns out their friend was here going to the concert so they gave us a ride. Great timing! They want us to come by tonight but I don’t think we’ll have time. We all vowed to catch up this summer and have them come up to Vail. We walked into the show and had great seats right up front. Soon after we arrived, the show started. 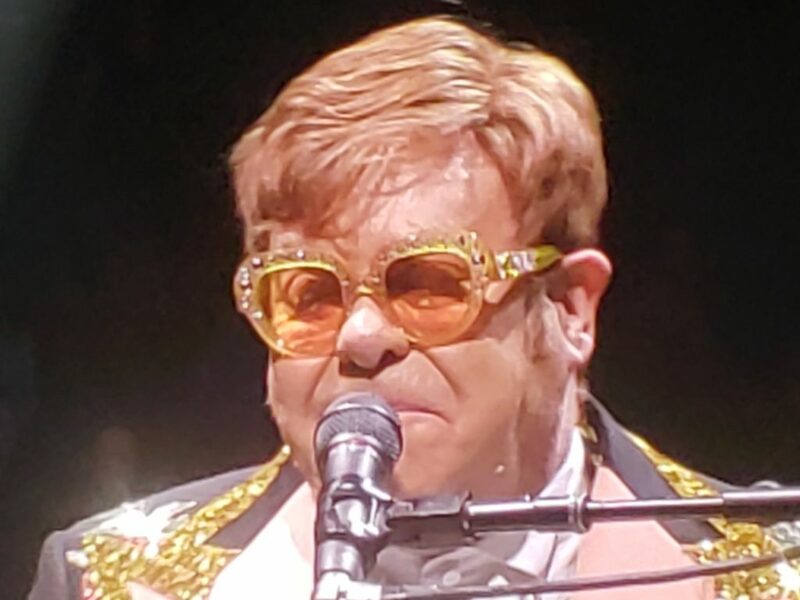 There was no warm up act, just Elton John and the band. Now most of you might know who Elton John is but his band is just as famous. They too were all in their 70’s but played just like they did, (or better) when I saw them in 1974 and many other times. My pictures aren’t coming through on my computer in our hotel so I’ll post some tomorrow. In one word, the show was amazing. I was texting Tom, Robi and other friends as it was just like being 18 again. It was so surreal and hard to explain. It was incredible, like a flash back to our youth. We decided we’re going to more concerts and the one to thank here is my beautiful wife, Lori. It was all her idea a few days ago to go. I don’t think she even knew how great it would be, maybe she did, ha. She’s pretty amazing herself. This morning we’re off to get her hair done and then will hook up with Tina for some lunch and shopping. Around 3 we’re headed to the car dealer to pick up Lori’s Range Rover. Seems a weight had come off a wheel in the snow which put it out of balance at highway speeds. The night before last when I called the dealer, he gave me a number to call yesterday morning and within 90 minutes they had a flatbed truck at our house to load it up and take it to Denver to fix it, all at no charge. We’ll get it this afternoon, leave our truck in Mom’s driveway and then go get Jag at the airport. On our way back up the hill we’ll stop and pick up the truck which I’ll drive home while Lori drives the kids in her car. Now that’s service! I think we’re going to see The Who September 29th. I found tickets in the 9th row so Tom you’d better decide now if you want to go! We can’t wait to see Jag tonight and Ty tomorrow. Again I’m so glad Lori had us go to the concert. It’s hard to explain all the feelings. Elton talked about how blessed he was and how this journey of life over the past 50 years had been so amazing. It was an older crowd but in many ways we were all alike for 2 hours. He was so honest and real and you felt like you were just hanging out with him at a party. Well time to get moving, I wish the pictures would come up but you’ll have to wait until tomorrow. Time to get ready and get on the Yellow Brick Road! We can’t wait for The Rolling Stones! Hold on, one picture came through, we were close! God Bless. Awesome, like I said last night, Elton John was my first concert. It was in 1974 too if I remember correctly. I remember what I wore – HA! I saw him in Arizona about 8 years ago too, I love him! We too love concerts and go to quite a few. We are going to see a band in Nashville called Blackberry Smoke at the Ryman Theater then the Stones in May and Lady Gaga in Vegas in October on my birthday! Great pic – keep rockin!